Last week I turned 30. To celebrate, I had the opening of Now You See It! The Slime Mold Revelation: an exhibit about art about slime mold that has taken over my life and the lives of everyone around me for the last 9 months. Friends and family came from near and far, and because I was interviewed on the local NPR station, lots of friendly strangers came, too. For over 20 years my mom, Constance, has helped with every over-the-top project I've set my mind to. Here, she ponders what's left to put in the cases. Also thanks to Acclaim Signs for the lovely vinyl lettering and decals on the entrance. My mom made this off-the-chain cake. Here, I'm installing a giant version of a 1942 illustration from the obscure and splendid Myxomycetes of Japan. Visitors see how young slime molds emerge from the bright red 'fruiting bodies', blossom into a giant gold 'plasmodium', and complete the cycle in the form of a spectrum of historical illustrations. A 'Travel Companion to the Wall of the Library' interprets this life cycle installation. It includes a 1960's poem by scientist George Martin about the slime mold life cycle. The plasmodium spreads above a graphic timeline about 400 years of artists devoted to slime molds. The timeline incorporates images acquired from collections around the world. Upon entering the library, visitors encounter a slime-centric curiosity cabinet. Here, they get a sense of diverse species thriving in diverse environments, represented by artists from diverse backgrounds. You can view specimens through magnifying lenses, check out artists' variations on those species, and wonder at the robot-cut cardboard plasmodium. The specimens that aren't mine are on loan from the lab of Dr. Stephen L. Stephenson, at the University of Arkansas. Historic photographs of local urban and wild landscapes create backdrop 'environments' for sculptures of various species. These representations of Physarum roseum were made from a mold (no pun intended) created by local sculptor Andrew Hoeppner. Instructional graphics were printed on "Sticky Fabric", which can be taken down and re-stuck many times. Folks can illustrate sparkly Diachea leucopodia as they observe it through a microscope, and then add their drawing to a growing collection on this giant twig. In order to appropriately deck out the kid's corner of the Library, my science illustrator friend Laura Frick and I led a workshop for kids at the Audubon Society summer camp. I turned the kids' illustrations into "stained glass." ...and that's a 9-month project! Now You See It! The Slime Mold Revelation: viewed from the UARK student union lobby. One week ago I was up all night at the Anne Kittrell Gallery, in the University of Arkansas Union, installing Now You See It! The Slime Mold Revelation. It's a spirited campus, and many encouraging visitors peeked in to see what was going on. Gallery Coordinator Cori McCleskey went above and beyond. In some ways the installation process was a dream come true. With the help of the biology department I'd been awarded grant funding; plus I had a slew of unsuspecting, hard-working undergraduate helpers by my side. Ben, an enthusiastic physics major, had an eye for gold blob placement. 12 hours before the opening lots of stuff was still sprawled on the floor, plus I spilled some honey near my snack pile. In other ways the gallery space and the installation process were challenging. Hours were numbered. Walls were brown, like much of the stuff in the exhibit. The space was large and looming, with no shelves or cabinets for slime molds to appear in and on as they had in the Seattle library. Here's the plasmodium in the cabinets of the library in Seattle. How to create the effect without cabinets? I waited until I arrived to figure out how to transition the exhibit from the library to the gallery, with this "curiosity cabinet" component being a main concern. Lo and behold I found an old, locked case sitting unused in the lobby. Due to Gallery Coordinator Cori's fastidiousness, the keys to the case had not recently been deemed too mysterious to keep, and we all shared a magical moment when the lid was lifted. Sculptures, gold plasmodium, petri dishes, specimens, and Dr. Stephenson's personal copy of the rare Myxomycetes of Japan all went in. Biologist Lora Lindley even brought over a dish of live Physarum polycephalum. Also a challenge: things take longer than expected. These "sticky fabric" graphics are supposed to be slapped right up on one wall after another, but Physarum roseum was slow to adapt to its new substrate. The timelines telling the stories of 400 years of artists devoted to slime molds ended up unfolding along the wall of windows at the back of the room. The gold plasmodium that had been in the cabinets got divided up, appearing and reappearing throughout the space. I wanted to obtain as few new materials as possible for this show. Luckily, the gallery had a drawer full of unused frames, and Cori was able to print off copies of my illustrations to fill them. Ramisa did a great job of hanging them in the sprawling fashion I'm fond of. Stemonitis axifera takes 20 hours to form these fruiting bodies. Then, slugs eat them, top down. This selection of Collaria arcyrionema was collected in the Philippines. Speaking of new species, here's the first-ever illustration of Perichaena longipes, my friend Laura Walker's recent Panamanian discovery. Without further ado, some more photos of the opening. The room was full of slime mold experts, some of whom were new to the phrase "jazz hands." A huge thanks to Dr. Stephenson (intrigued by the plasmodium, above), to the UARK biology department, the folks at the Anne Kittrell, and to all of you who made it through this blog post at home. Last week I turned 30. To celebrate, I had the grand opening of the exhibit I've been curating / designing / fabricating over the last 9 months. I'll share some photos of the party soon, but first, an important back-story about one of many obstacles I faced in the week and a half preceding. Slime Mold Life Cycle concept sketch, presented via Skype to my friend / biologist Laura Walker. The above images illustrate how a slime mold's life works. 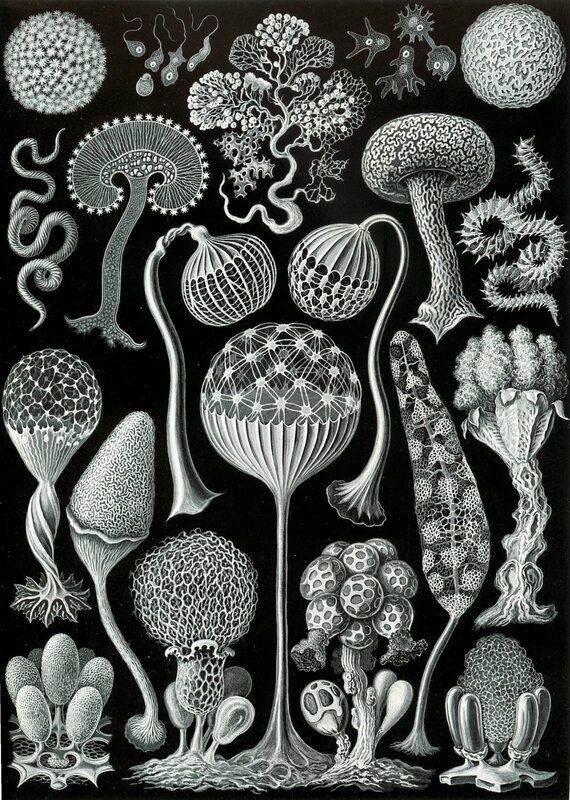 Complex, bizarre, and combining aspects of the lives of animals and fungi, this cycle has befuddled scientists and illustrators for centuries. I decided to translate the scientific storyline into a giant gilded installation across the wall of the Library. My friend Tom came all the way from Upstate NY to help me install it. 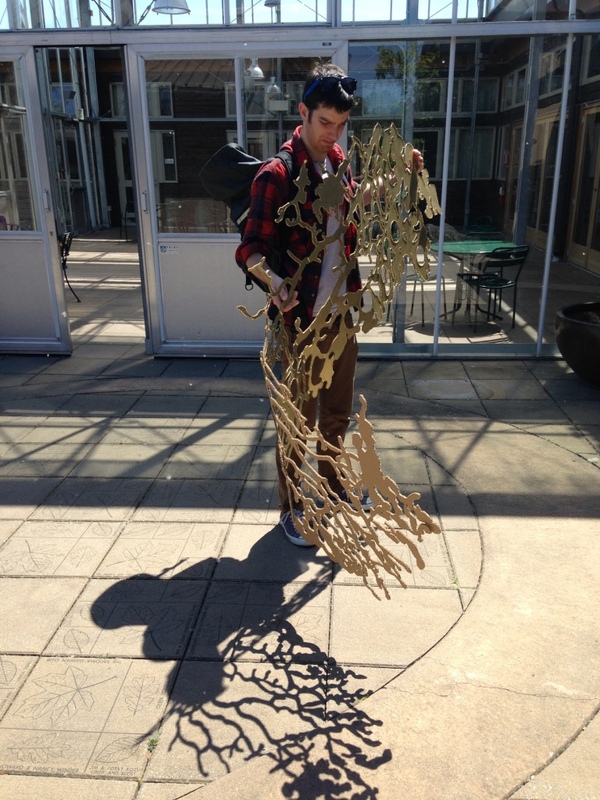 Tom and I installed this cardboard sculpture of a plasmodium (a young, one-celled slime mold) a week and a half before the opening. But, the Library kindly asked us tontake it down. Earlier, I wrote about my desire to make exhibits completely out of "sustainable" and biodegradable materials. But as I said, this time around, I used some spraypaint. Turns out, reasonably enough, the Library is not cool with spraypaint. So, we took it down and shoved it back in my trunk. This time Tom didn't bother to lay between its layers, clinging to it to keep it from escaping as I drove across town. What was I going to do? I couldn't spend more money on the plasmodium. My mom was in town by now. We started making a new one in the most sustainable way possible, out of my vast piles of paper waste from the exhibit design process. But it looked a lot like trash. To make a long story short, my mom and I found an environmentally friendly sealant at an environmentally friendly hardware store, slathered it on the by then well-worn sculpture, and convinced the library that all was well. They very kindly allowed us to stick it back up on the wall. It looks way better than trash, I think, but I will probably steer clear of spray paint from now on. Here are some images of the exhibit's conception, gestation, and installation. First, I should explain that I've been immersed in slime molds for the past few years. I'm making illustrations for world-renowned slime mold researcher Dr. Stephen L. Stephenson, at the University of Arkansas. Second, you'll want to know more about slime molds. Slime molds are the golden spore-filled blobs that appeared in your lawn overnight. They're the iridescent millimeter-tall corndog-looking things on your houseplant. The tiny parfait-cups and elaborate orange pretzels you stepped on in the woods. Slime molds are one-celled, bacteria-eating protists that travel the detritus of every continent. So if they're so small and sparkly, Why the gross name? Slime molds begin their life as a fluid, pulsating, traveling, multinucleate cell called a plasmodium, like the cardboard one Todd is holding. Plasmodia can grow to be many feet long -- but still, they're just one cell. The holes are for petri dishes. I designed this plasmodium as a vector so that a robot could cut it out with the push of a button. But in the end, it became necessary to supplement the robot's job with manual labor. Many generous humans stepped in to cut cardboard the old-fashioned way (with a Dremel tool and beer). (This is a test.) Slime molds thrive through the formation of the Montlake Cut. Nothing says Awe and Wonder like a diorama. I aspired to use free and natural materials: cardboard for the underground plasmodia, wax for the fruiting bodies (red and brown), Soy-based inks for the background images. In the end, to be honest, some chemicals got mixed in. One day all my exhibits will be made of mycelium and treasures from dumpsters. I did lots of Photoshopping to show myself and others how things might turn out. Enlarged on the walls and windows will be the incredible and little-known illustrations from The Myxomycetes of Japan, 1977. I e-mailed slime mold art experts around the world in order to 'curate' and acquire images for the graphics in the exhibit. Here are some of the ones I got my hands on. Giulielma Lister, early 20th century. Miss Lister painted every slime mold known at the time. A photo from an international slime mold Facebook group. Pier Antonio Micheli, 1729. Pier discovered spore germination. Nobody really cared. Sakuma Bungo, circa 1942. At 71, Sakuma decided to spend the last year of his life drawing slime mold. This one's mine: Craterium leucocephalum with inner structure and spores.